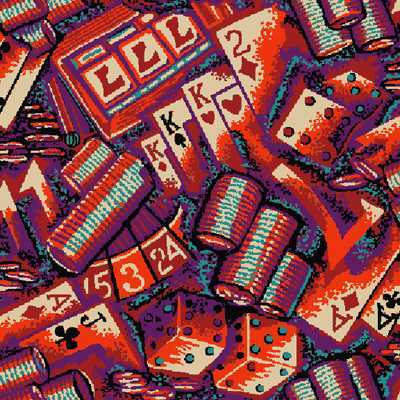 This casino carpet style is perfect for decorating any gambling center or game room. Look at the royal colors of red and purple hi-lighting the Slot Machines, Roulette Wheel, Chips, Poker Cards, Black Jack and the Rolling Dice - all producing subliminal messages to "let it ride". Stare at this casino carpet long enough and anything can happen -- no matter how high-end the casino! Believe it or not, this design serves another key purpose. It hides the mess made by hundreds of thousands of people who traipse over it all day. Carry out your gambling theme to the extreme, even under your feet.